So you stumbled upon this article and rather than continue scrolling you've decided to see for yourself if NES Baseball is haunted. Well I have good news and bad news. The good news, NES Baseball is definitely haunted and you have not wasted your time by clicking on this article. 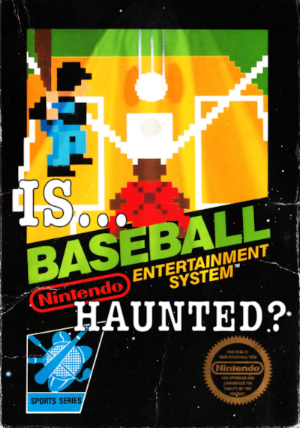 The bad news, NES Baseball is haunted. It's true, while playing and reviewing all the NES launch games that Nintendo put out in it's limited 1985 North American run, Baseball looked pretty innocent. Developed by Nintendo R&D1 and designed by Shigeru Miyamoto, the game was both necessary for the console as well as a labor of love from the company. So why make the game haunted and potentially expose millions of children around the world to the paranormal? Well unfortunately, NES Baseball's other worldly origins is nothing more than an accident. 1) If you are hit by a pitch, it goes right through you. Crazy right? Baseball has been played every year since at least 1856 (a very haunted time in America) and yet no one can name a single instance in the well over 100,000 plate appearances where a player was hit by the pitch and the ball went right through them. The reason being, of course, that only really happens to ghosts. Thankfully, the umpire is smart enough to know that if you're not actually touched by the ball you don't deserve first base and thus the ruling in NES Baseball is just "Ball." 2) The team names have some creepy alternate meaning. Most fans of the haunted NES Baseball know that A,C,D,P,R, and Y that represent the teams are actually the initial of the MLB team they represent. But have you ever tried looking at those teams in a different order. It may shock you to find out that words like CRY, PRY, and PRAY can all be spelled with those team names. CRY of course because of the terror of playing a Haunted NES game. PRY, like how the paranormal spirit of Baseball's Past will use his hands to pry your loved ones out of your cold hands. And PRAY because the only thing you can do to hope that you're not haunted by your childhood copy of NES Baseball is to pray to your God(s)' forgiveness for ever bringing that demonic possession into your house. 3) You don't have any control over your fielders. What may seem like a design choice actually conveys a deeper lore in the world of NES Baseball. You don't control the fielders, not because it was programmed that way, but because they are all DEAD. At the very least, they were once dead and are now zombies slowly marching without thought or input towards a ball that has little to no meaning to them. I've actually heard a theory that they believe the baseball to be a human brain thus explaining why they chase after it. Which leads me to my final point. starring Danny Glover and Tony Danza. And it was called, Angels in the Outfield. Seriously. Angels in the Outfield is a 1994 American sports horror film. In the film, a young boy named Roger, who has lost his mother, is living separated from his father. He prays for the Los Angeles Angels to win the pennant and over the course of the next hour and forty-two minutes is forced to watch his friends, family, and the city of Los Angeles pay the ultimate price for his greed. It spawned two direct-to-video sequels, Angels in the Endzone and Angels in the Infield (neither verified by the Author to be about NES games). And there you have it, NES Baseball is haunted. Unfortunately, for many of you now reading this you're also remembering that your boxed childhood copy of the game is sitting in your Parent's attic. It's never too late to call your local church and schedule an exorcism.